With AWS Lambda, we eliminate the need to worry about operations. We just write code, deploy it, and it scales infinitely; no one really has to deal with infrastructure management. The size of our team is half of what is normally needed to build and operate a site of this scale. Bustle.com is a news, entertainment, lifestyle, and fashion website catering to women. Bustle also operates Romper.com, a website focused on motherhood. Bustle is based in Brooklyn, NY and is read by 50 million people each month. Bustle was originally running on a third-party platform as a service (PaaS) but migrated to using AWS OpsWorks to gain better scale and availability. The site was built as a monolith and had trouble scaling. There was also a fair amount of server management, automation, and monitoring involved in order to keep the website running smoothly; this raised the barrier of entry for new engineers to roll out new code changes. The engineering team wanted to focus on areas where they thought they brought the customer the most value, which was building front-end features instead of dealing with operations. Bustle started to use AWS Lambda to process high volumes of site metric data from Amazon Kinesis Streams in real time. This allows the team to get data more quickly so they can understand how new site features affect usage. They can also now measure user engagement, allowing better data-driven decisions. The team also decided to explore using AWS Lambda and Amazon API Gateway for running an entirely serverless website. To test, Bustle built Romper.com using Ember.js and Riot.js running on a serverless backend comprising AWS Lambda, Amazon API Gateway, and a self-managed Redis data store. Bustle also built their own AWS Lambda and Amazon API Gateway software-delivery tool, allowing developers to easily do integration tests and deployments when they are ready to release their code into production. The serverless back end supports the Romper website and iOS app as well as the Bustle iOS app. Bustle plans to migrate all of Bustle.com to the serverless back end. 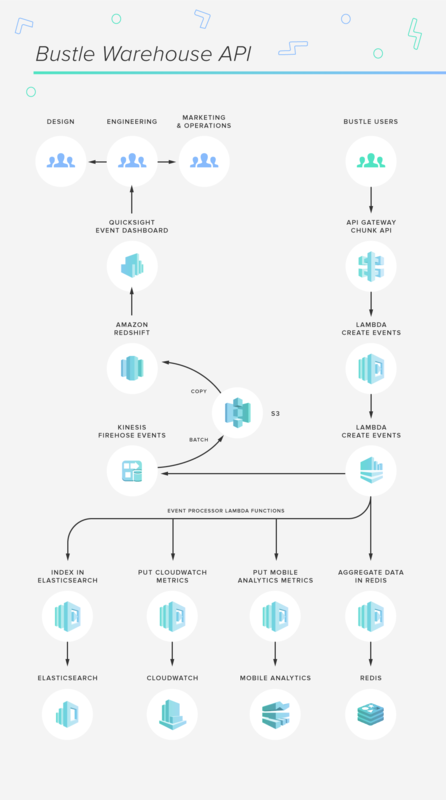 With AWS Lambda, the engineering team now puts zero thought into scaling applications. There is an extremely low cost for any engineer to deploy production-ready code that will scale. No one has to deal with infrastructure management, so every engineer can focus on building out new features and innovating. With no operational maintenance of servers, the team can remain small, with half the people normally required to build and operate sites of Bustle’s scale. Bustle has also experienced approximately 84% cost savings by moving to a serverless architecture. To learn more about how AWS Lambda can be used to run serverless web and mobile backends, visit our AWS Lambda page.